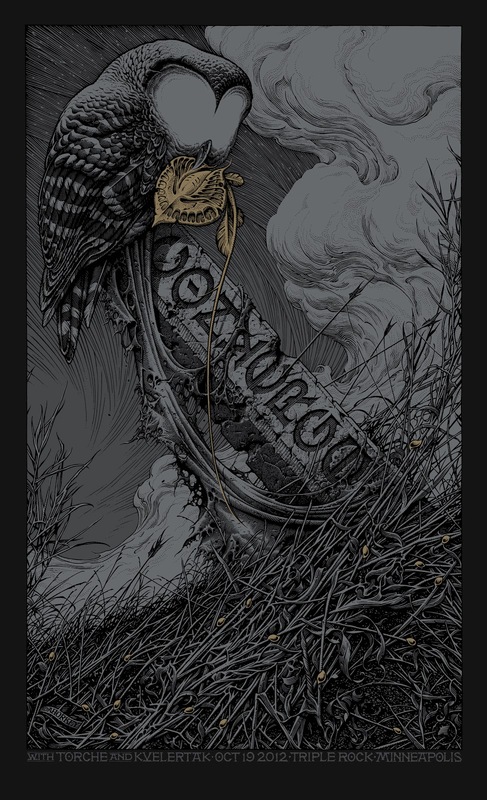 Votes have been tallied on Expresso Beans for Art of the Year and Aaron Horkey’s rock poster for the show October 19, 2012 at the Triple Rock Social Club in Minneapolis, MN received the most love. You can see how all the posters placed at the link Expresso Beans Winners. For those unfamiliar, Expresso Beans is a not-for-profit art collector’s community resource built and maintained by volunteers. They provide a wealth of information about graphic art including dimensions, editions, medium and technique, ebay auction tracking, past and current sales histories, price averages and much more. Free membership includes personal collection tracking, buying, selling and trading art, the exclusive EB matchmaker, forums, email notifications, to name just a few. Becoming a member will allow you to vote each week on which poster you like the most. It’s a great resource.